Anyone know where this word came from? Besides just sounding cooler than brochures, reports, whitepapers and stuff, I figure it’s about things coming at you side-by-side leading to the desired results. The way integrated marketing plans are supposed to work. The Agency: David J. LeVant, Inc. The Assignment: Help a leading consultancy firm communicate their expertise and offerings at a healthcare industry conference. The Answer: Produce a family of collateral, one that quickly introduces the company and one that clearly presents their most unique offerings to the specific attendees. 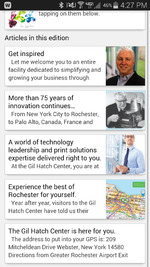 The Assignment:Create a welcome to Xerox’ Gil Hatch Center for Customer Engagement that’s as impressive as the facility itself. The Answer:Craft a brochure and mobile app that outline the history of Xerox, the offerings of the Gil Hatch Center and the top recreation and entertainment venues to catch while in town. The app won the RAMA Pinnacle Award for Online/Interactive Marketing. The Assignment: When Roughneck Lodging bought the hospitality division of Signor Group, they needed to rebrand all materials including their website and they capabilities in time for the big trade show in Odessa, TX. The Answer: New copy in a new brand tone and new design by Mike Mooney. The Assignment: Let all who are waiting or being cared for in the Emergency Room know that there is a new 1-hour maximum wait time for nursing attention. The Answer: A simple, friendly, creative poster signed personally by the Chief Medical Officer. (This assignment was the basis for the second "Next Top Copywriter Contest." Check out the challenge and entries right here. The Assignment: Rebrand RSA with new logo, tagline, voice and graphic design standard that highlights their innovative solutions to business and printing workflow challenges. 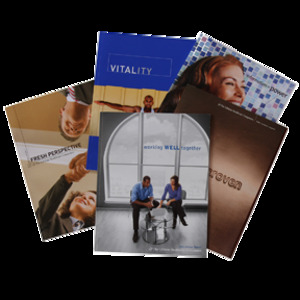 The Answer: The new tagline Turn Printing into Productivity and accompanying logo design debuted in a corporate brochure that led off a series of brochures and sell sheets for each company product and solution. The Assignment: Announce the rebranding of existing books and publishing of additional titles to the retail bookstore market for three different series of instructional guides. The Answer: One very cool, very bold catalog for all the new and improved titles featuring the snazzy new tagline for the signature series, "Know How. Right Now." In fact, it was the basis for the first Copywriter Contest. The Assignment: Let doctors, health care administrators and governments visiting national tradeshows know there's a better way to share health information, improve health care and reduce costs. The Answer: A slick little slick. The Assignment: Roll out a new service level to key accounts, including much of the Fortune 100, that features a dedicated sales rep and a broader library of research. The Answer: A new name and elegant brochure for the Enterprise Partners program. The Assignment: Tell ratings companies, customers and prospects all the things Lifetime does and how solid a company they are. The Answer: Year after year, create an annual report that can double as a capabilities brochure for each of the company’s subsidiaries ... and earn a bunch of awards along the way. The Assignment: Introduce advertising agencies to a web development partner on the cutting edge of content management systems. The Answer: Create a brochure that can be customized and personalized with variable data and allow prospects to see themselves as the heroes they can be for their clients. The Assignment: Get clients to talk about finances more effectively with their families and invite their rep to the table. The Answer: Take it step by step. With support all the way. Start with a brochure explaining how important family meetings are and then offer a series of conversation starters to make them painless. The Assignment: Demonstrate the business potential of digital printing and variable data for retailers. The Answer: Create a company and print its brochures on demand, personalized for the audience, in the Xerox booth at the leading print expo. The Assignment: Explain the concept of consumer directed health care in a way that intrigues and doesn’t overwhelm employers or their employees. The Answer: Keep it simple. Make it graphic. And lead with the undeniable benefits. 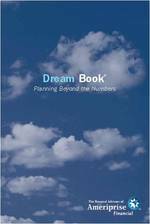 The Assignment: Update the signature Dream Book to speak to younger investors about their ideal future too. The Answer: Take a page from USA Today. Don’t just make the language hipper, add interesting bites of statistics and cool work sheets.